IN the West, Christianity is in radical decline, and in Australia is about to become, if it has not already become, a majority atheist nation, foreign editor of The Australian Greg Sheridan says. “Humanity is always thirsting for God, but it is in revolt against God as well,” the veteran journalist and author said. 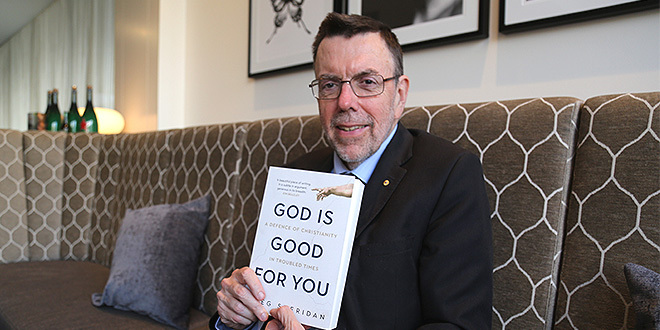 Mr Sheridan said the idea for his latest book God is Good For You: A Defence of Christianity in Troubled Times came to him after attending some of Australia’s major writers’ festivals. Among the hundreds of books promoted and referred to, he did not see a single one that imparted Christianity or Judaism. “So I thought there is this knowledge gap,” he said. “How can you know anything about western society if you don’t know about Christianity? Mr Sheridan, passionate about his Catholic faith, said he believed Christians should now think of themselves as a bold minority. “We Christians lack situational awareness,” he said. The 2016 census figures show 52 per cent of Australians identifying themselves as Christians – down from 61 per cent just five years before. Mr Sheridan said the “high priests of the new atheism” writers Christopher Hitchens and Richard Dawkins “don’t make any substantial arguments and have bluffed Christians out of their belief just by saying ‘it’s ridiculous, it’s foolish, nobody with any sense believes anymore – no scientists believe’”. He said not only were the arguments of the new atheists untrue, answers could be found throughout the history of the Church – if you go looking. “Christianity from the start contained everything that we like about modernity,” Mr Sheridan said. In one section of God is Good For You, Mr Sheridan examines Christian belief among political leaders, and their stories reveal people of strong religious views – stronger than imagined. He calls on contacts and friendships built up over many decades to interview current and former political heavyweights – including Malcolm Turnbull, Kristina Keneally, Kim Beazley, John Howard, Kevin Rudd, Tony Abbott, Peter Costello and Bill Shorten. “Without exception they were all reluctant to do the conversation,” Mr Sheridan said. “As Kristina Keneally pointed out, politicians tend to be more religious than the average population. “They are joiners, they are trying to make a contribution, they believe in doing something for the good. “And they are reported on by a media which on the whole is more irreligious than the general population – more secular, more athiest. Mr Sheridan is close to Mr Abbott and has fine, jocular relations with Mr Turnbull, but in writing God is Good for You, he could not have predicted that new Prime Minister Scott Morrison would soon be in the lodge. Only last week, writing in The Australian, Mr Sheridan pointed out that Mr Morrison was probably the first leader of a significant western nation to be a faithful member of a Pentecostal Christian church. “Our top three positions in government are now held by a Pentecostal PM, a Catholic deputy PM and a Jewish deputy Liberal leader,” he said in his column. In researching his book, Mr Sheridan examined the growing strength of Australian Pentecostals. He visited the Planetshakers Church in Melbourne and “enjoyed their services, their optimistic upbeat attitude”. “This is certainly a booming, lively, active, growing Christian community,” he writes. And while Mr Sheridan’s musical taste tends towards Gregorian chant, he doesn’t have any complaints about the quality of Pentecostal rock. “They do it really, really well,” he said. “When some Christians have tried to make their message culturally relevant that has meant effectively changing or watering down the message. “The Pentecostals on the other hand are using the most contemporary techniques imaginable to deliver a traditional message. Mr Sheridan devotes a section of his book to Campion College in western Sydney – a small liberal arts tertiary college in the Catholic tradition on a site of a former Catholic seminary. It receives no government funding and Mr Sheridan writes, “If our civilisation has a real future in Australia, it will be connected to Campion. For Campion has done something that no other institution of higher learning has attempted in Australia”. “It has dedicated itself to immersing its students in the great tradition, based on the great books of Western civilisation,” he said. “Campion students study Shakespeare and the Bible, but naturally they study much more than that.